There are cloths and then there are sponges....with MAXI WIPES you get both! The ultimate thick sponge cloth, that can absorb 8 times its own weight in liquid, be squeezed, rinsed and reused, even laundered for longer life! Furthermore, it is colour coded for applications in healthcare and hospitality. Colour coded sponge cloths...who would have thought...the applications are endless, but we've outlined a few below! MAXI WIPES are high in rayon fibres, which gives them their huge absorbency capacity to soak up multiples times their own weight. The viscose content also ensures that the cloth is soft and will not scratch surfaces. They are compact packed, and the convenient packs can easily be distributed around a workplace on tables or carried by staff for quick wiping of surface spills and dirt. They are a great multi-purpose cloth with applications in just about every industry you can think of where a large spill needs to be soaked up quickly! AUTOMOTIVE MAXI WIPES have applications in washing and drying vehicles, trucks, buses and even boats. Their soft texture ensures that metal and fibre glass surfaces will not be damaged, and their thick absorption abilities make them useful in drying wet vehicle bodies that need large quantities of water removed after washing. Very popular with automotive resellers, car valeting and detailing companies, as well as car wash businesses. HOSPITALITY MAXI WIPES have applications in hospitality venues such as hotels, pubs, clubs, bars and of course in restaurants and cafes where they are used both front of house in the serving areas and back of house in the kitchen and food processing areas. As mentioned before, colour coding of these cloths is a requirement in most of these hospitality venues due to the risk of cross contamination between the various activity areas. INDUSTRIAL MAXI WIPES have applications in soaking up spills in manufacturing, mining, engineering and other factory environments where historically recycled tshirts were the only cleaning material available. Now MAXI WIPES are available as a workshop rag alternative, offering the same if not better benefits. They too are soft and non-abrasive, absorb water and solvents, and are economical. The notable benefits that these cloths have over rags are that they are uniform in both size and nature which reduces wastage and guarantees consistent performance, whereas bags of rags are notoriously inconsistent in both absorbency, mix and cut. Also, unless the rags have been metal detected, they may have sharp metals still in them from zips, pins and buttons, which can scratch surfaces and be harmful to the user. Another advantage of MAXI WIPES is that they are cleaner and more hygienic than recycled t-shirt rags, and they are also less bulky which makes them cheaper to ship and store. MEDICAL MAXI WIPES have applications in organisations such as hospitals, dental clinics and veterinary practices, as well as in healthcare facilities such as aged care and childcare. They are very soft on the skin and can be used as patient or child wash cloths. The impressive absorption abilities of the cloths make them useful in wiping up accidental urine spills from both animals and humans, and there low cost point allow for them to be used as a disposable wiping solution in these instances. They can also be used to dry instruments, absorb other random surface spills, and wipe down medical equipment. 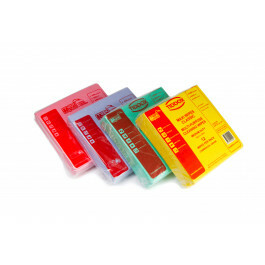 Again, the colour coding characteristics of these cloths are very useful in medical and HEALTHCARE facilities, which tend to allocate green cloths to kitchen areas, blue cloths to general areas, red cloths to high germ areas such as toilets and bathrooms, and yellow cloths to speciality areas or tasks. Above are a few examples of the industries in which the MAXI WIPES are used, but there are many more industries and applications for this high quality, super absorbent product. If your business is not already using them, give them a try...you won't be disappointed! Other related products from TIDDOX 's range of cleaning cloths include the MAXI WIPES PREMIUM , the GIANT TITAN VISCOSE CLOTH, and the GIANT SUPERMAX CLOTH.